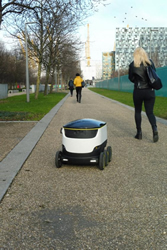 MARK BLUNDEN for Evening Standard: A delivery robot tested among the crowds of central London is set to start being deployed in the capital. The self-driving, battery-powered box on wheels is poised to undertake local delivery trials in Greenwich following 3,000 hours of testing. The robots by Starship Technologies have been described as “ground drones” and were created by former Skype co-founders Ahti Heinla and Janus Friis.